Kiyomi Watanabe (center) with Philippine Judo Federation president Dave Carter (left) during the awarding ceremony. 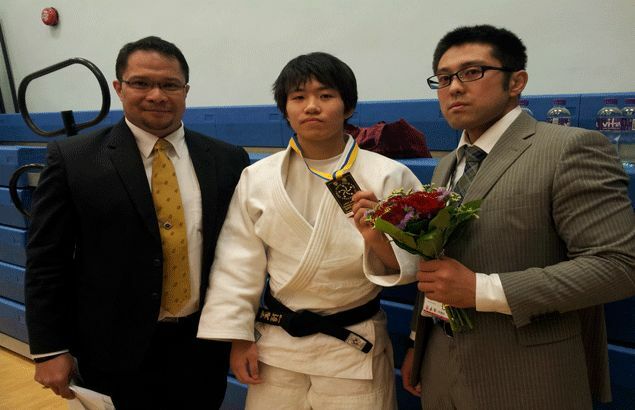 KIYOMI Watanabe handed the Philippines its first-ever gold medal in the Asian Junior Judo Championships held last December 13-14 in Hong Kong. The 18-year-old Watanabe beat Aigerim Abilkadirova of Kazakhstan in the finals of the women’s -63kg division to register the breakthrough win. The performance was a vast improvement from Watanabe’s bronze medal showing in last year’s edition of the meet held in Hainan, China. The Fil-Japanese won a gold medal in the 2013 Southeast Asian Games in Myanmar and saw action in the 17th Asian Games in Incheon, South Korea this year. Watanabe hurdled two judokas before reaching the finals, beating Tursunpashasha Nurmetova of Uzbekistan and Renu Kundu of India, respectively.